That’s a tough one. Besides children who poo in front of the supermarket in Mauritius, me crashing a Hummer H3 and my husband asking locals all the no go questions? 😉 What was our most embarrassing story? One of these embarrassing stories happened some years ago. In 2008 we made holiday in Madagascar without children. They simply weren’t born yet. 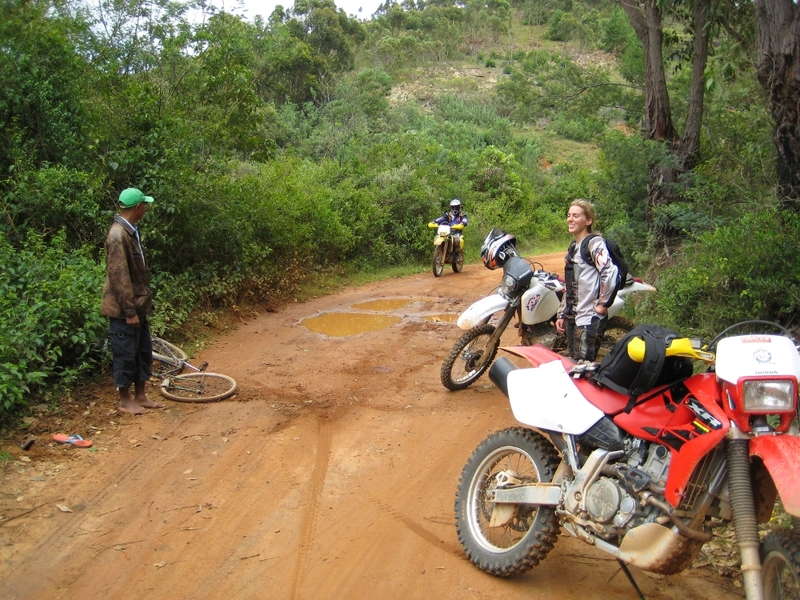 Because we both love driving Enduro (offroad motorbike) we hired them at Antananarivo. The capital of Madagascar is 1435m high and surrounded by lush, green nature. Together with a private guide we started exploring a totally different Madagascar, not many people have seen on their Motorbikes before. One afternoon my husband and the guide were a bit fast for me. We drove on a muddy road with puddles and I thought I have to accelerate to catch up with them. Otherwise they have to wait too long for me and it’s anyway not so much fun to be last. So I accelerated. The muddy road made a curve and exactly in front of me on my side appeared a bicycle rider. He wanted to avoid the huge puddle on his side and decided to drive on mine. Unfortunately I was too fast to break and stop in front of him. Therefore I decided to break like hell and slide on the ground with the motorbike under me. A word and a blow and I threw down the madagas Man. Both lying on the floor the first thing was to set upright the motorbike. Otherwise it won’t start anymore. I managed to do it on my own while the Madagas stood next to his bike and curiously looked at me. The moment when I took my helmet off and he saw that I’m a white, blonde woman he forgot to close his mouth. We were really offroad. They might have never seen someone riding a motorbike before and then it’s even a woman. My french talking skills are okay, but he understood only madagas. So we waited and waited until I finally heard two motorbikes coming nearer. Our guide Gee was able to translate and we ended up buying the guy a new bike. He pretended to being hurt, although he looked mighty fine to me and started hobbling only when the guide arrived. That was stupid and also embarrassing to heart someone but not being able to communicate and solve the situation. What happened to you? Share your embarrassing story with us! A good one, Barbara. The communication is very important in a situation like that. Oh no! How did you come back? It’s exactly the situation when I ask myself: How could I be so stupid?